Did you collectors know dolphins are so smart that within a few weeks of captivity, they can train people to stand on the very edge of the pool and throw them fish. 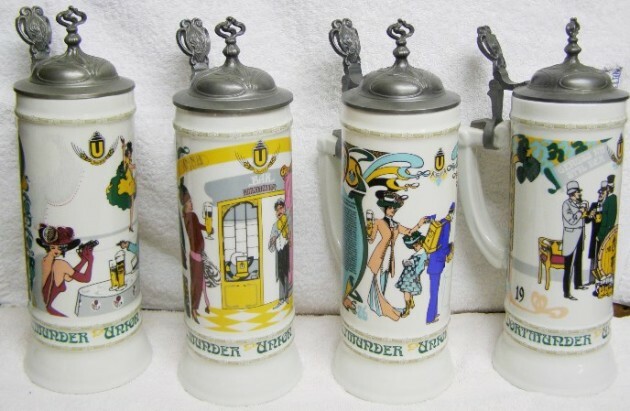 Dortmunder Union Beer – Shown ▲ a series of anniversary steins. 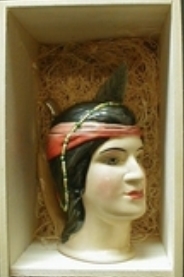 New, but decorative. 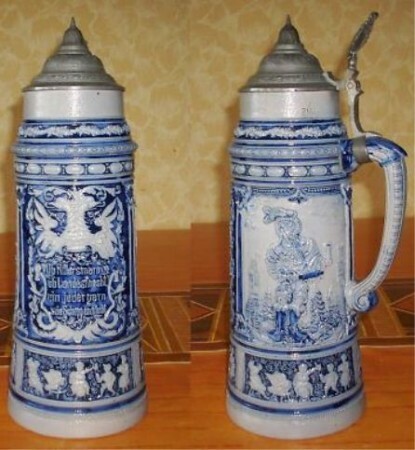 Dorfner and Co. (“D&C”) – Above ▲is an beautiful beer stein created by Dorfner and Co. 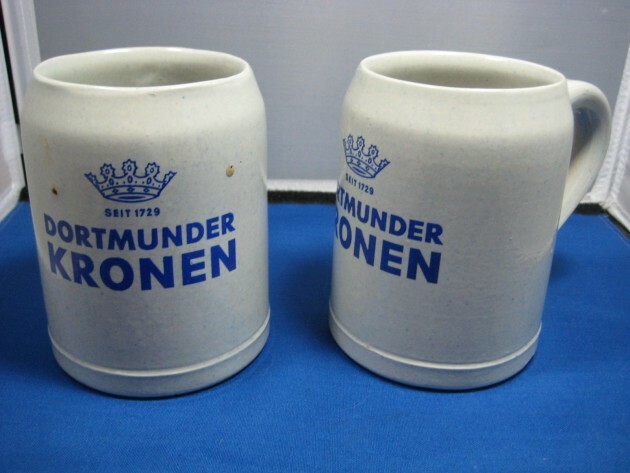 The company was established in 1829 in Hirschau, Bavaria and existed until 1890. 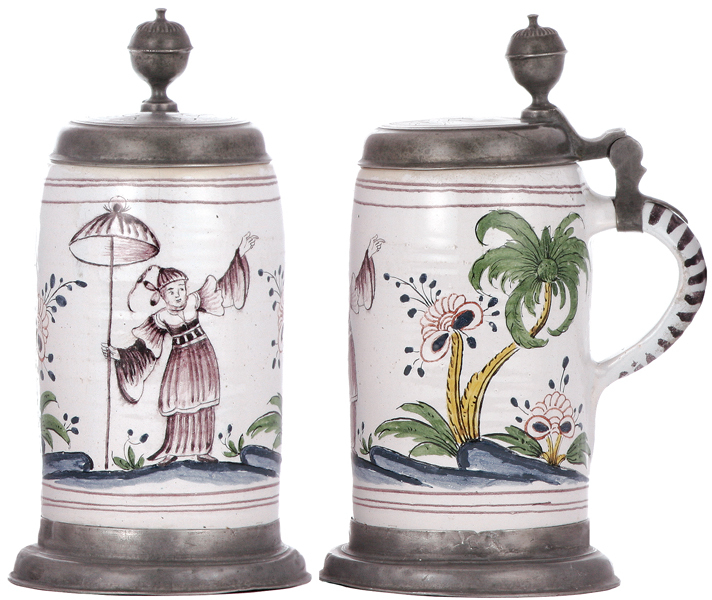 It produced high quality beer steins that are actually quite scarce. 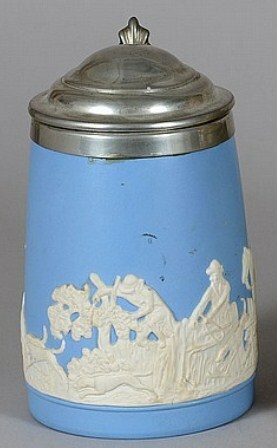 Made in majolica technique – of earthenware with a heavy tin glaze. 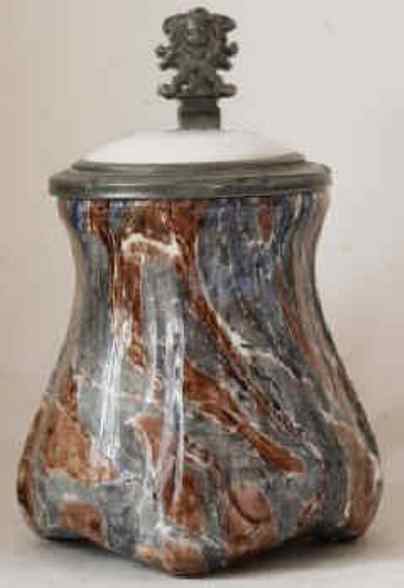 The glaze imitates multi-colored marble. 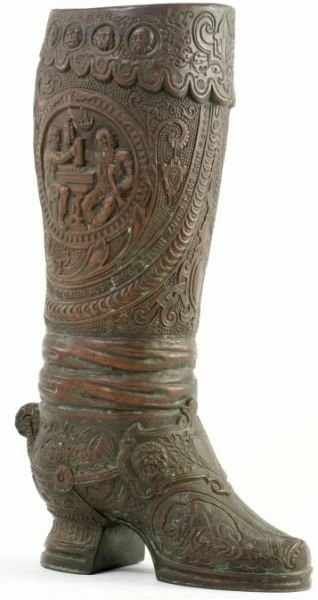 These were manufactured around 1860s – 1870s as indicated by the mark and also the hinge type, an interesting baroque-like scroll form. 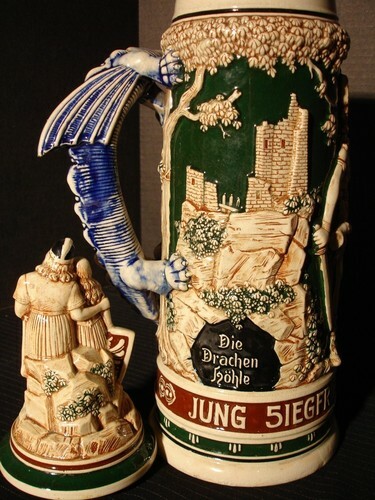 Some very similar steins were produced at this exact period by other factories – Villeroy and Boch factory in Luxemburg and the Sarreguimines factory. 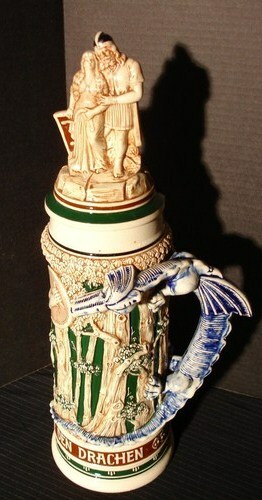 The V&B stein were usually made of marble stoneware with two-tone pattern and Sarreguimines were usually brown glazed. 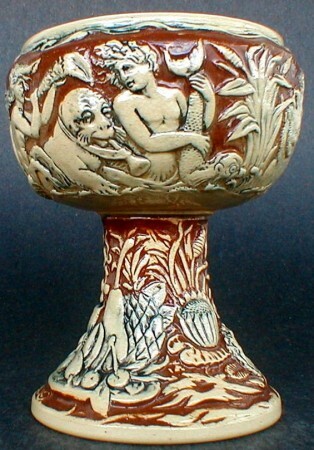 Drfner’s multi-colored marble glaze is very unusual. Gebrüder Dorfner, on the 16th January 1895. 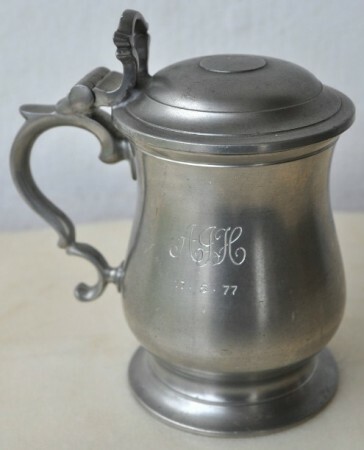 Double “C” [or] Double-scroll handle — A sinuous line of S-shape, or composed of reverse curves, used frequently in the design of handles, mostly English pewter and sometimes silver. 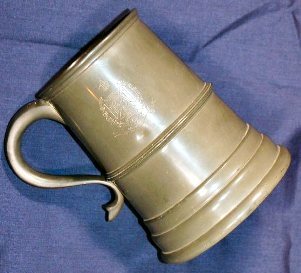 Shown above ▲: A British pewter mug / cann named to the 62ND Regiment (Inf.) Unknown exact age, Circa 1870 I believe. It has 3 dice in the bottom between two glass bottoms. [FWTD] ……………………………………………………………………………………………………………………………….. 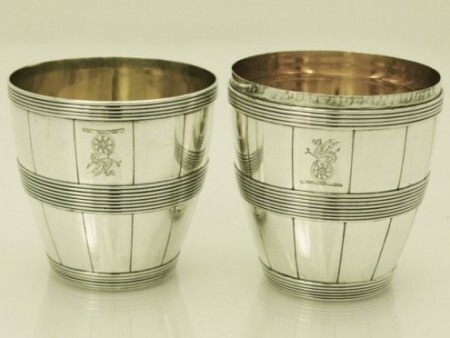 Double cup or beaker: Two identical beakers, one of which has a rim that fits inside the other. 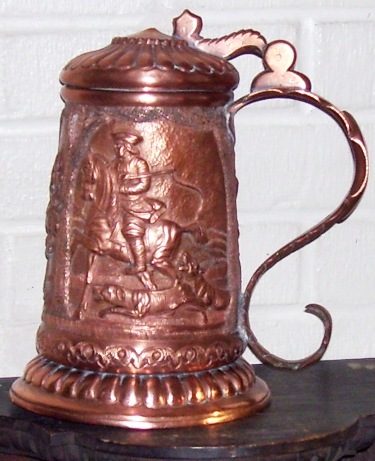 Usually made in metal and popular from the 1600’s throughout Europe. ………………………………………………………………………………………………………………………………. 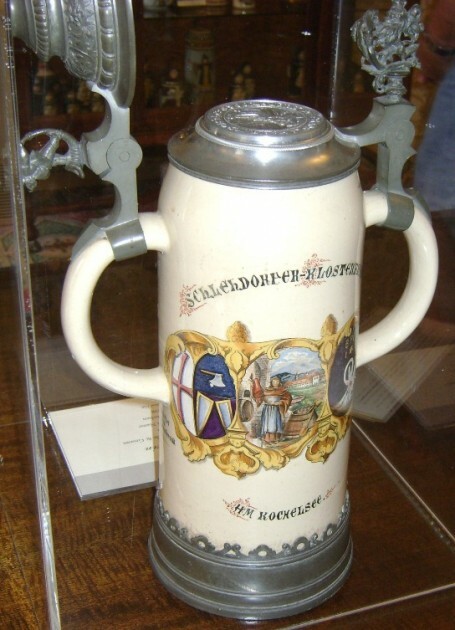 One beaker is slightly larger because of the added rim. 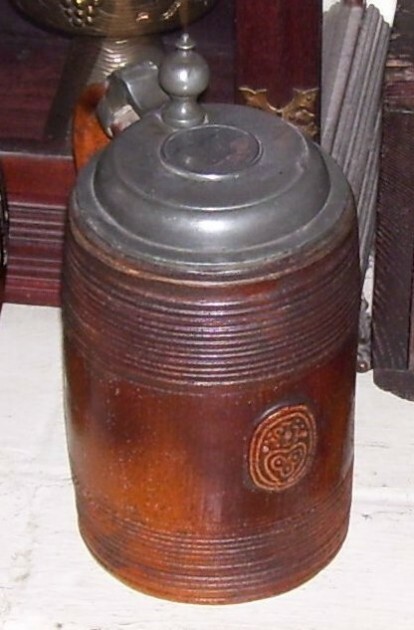 Lots of the antique examples are now missing one of the cups – such as I assume the one shown just below ▼ had happen. 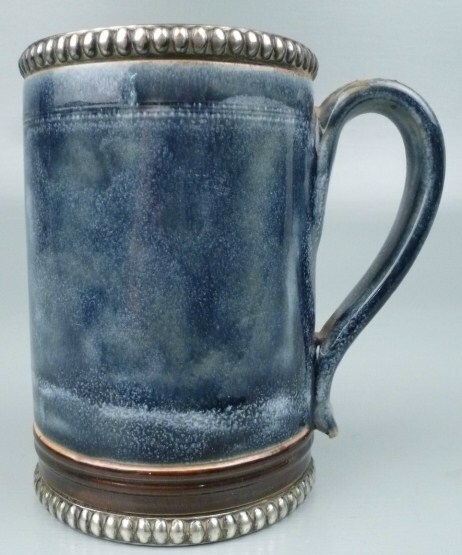 Doulton Lambeth stoneware mug with Sterling Silver mounts. 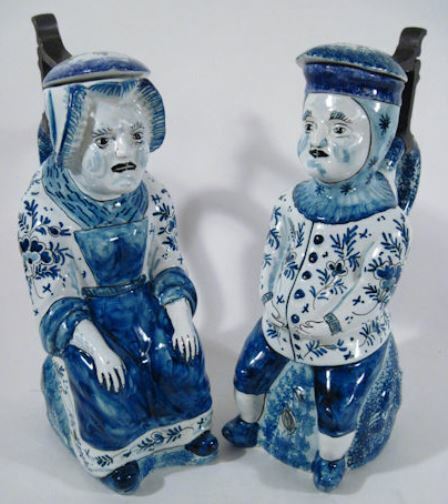 ……………………………………………………………………………………………………………………………..
Doves kissing – Shown ▲: 5L, blue milk glass, enameled, “Zum Andenken,” (In Memory), Ca. 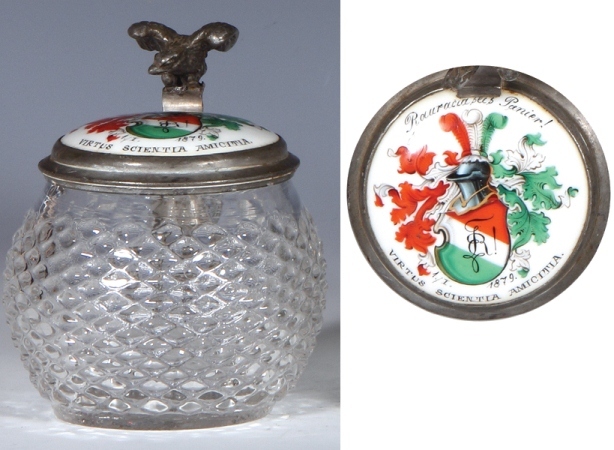 1840, with the thumblift of the two “doves kissing” which always indicated love / great admiration. 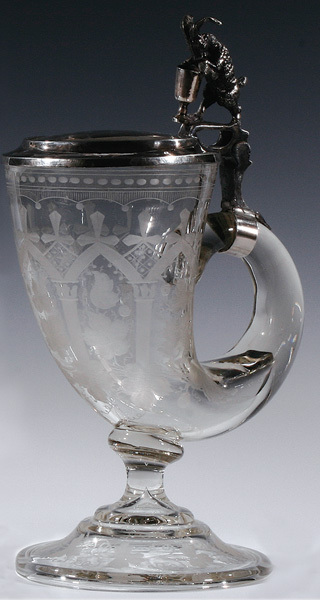 Doves are seen on these thumblifts and on early enameled clear glass steins usually over a painted heart and infrequently on engraved clear glass stein from the early 1800’s, as shown below ▼. 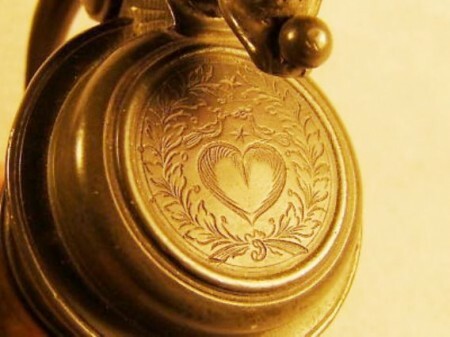 ……………………………………………………………………………………………………………………………………..
Not a good photo ▲, but this 1600’s roerken’s pewter lid has a brass insert with the German “LOVE” symbol / icon of the two doves over a heart engraved on it. [FWTD] Doves and Heart. 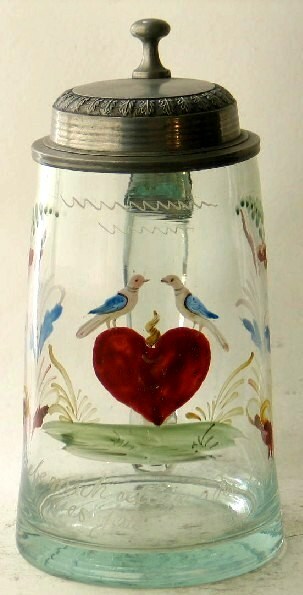 – See: “Hearts and Doves,” in this site’s Compendium. 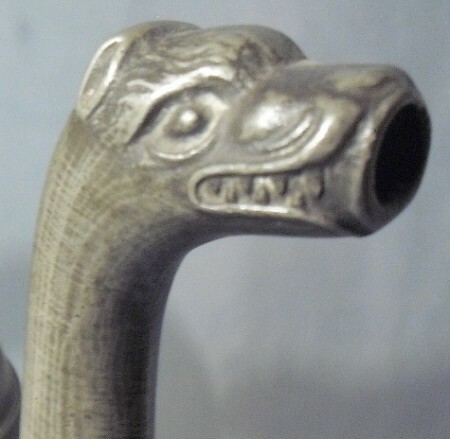 Dragon spout – Most often found on pewter wine servers from the 1700’s. 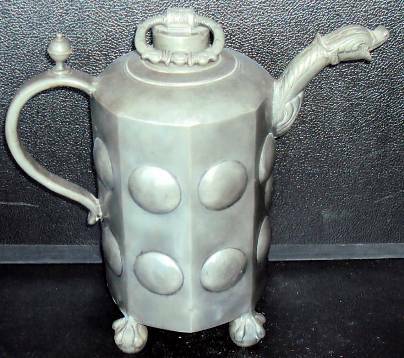 Later on some of the early coffee pots. 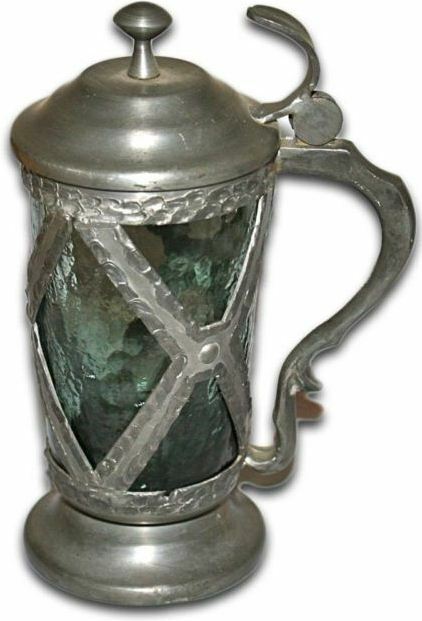 ……………………………………………………………………………………………………………………………..
Drangsgaard – A small firm in Norway that made modern hand crafted pewter items such as this tankard with a glass insert. 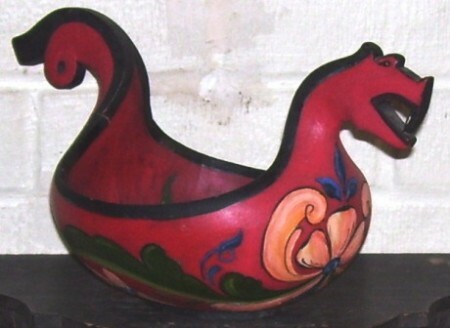 Drinking bowl – handled (Also called “beer bowls.” ) – A favorite vessel in Scandinavia and the Baltic States and Russia, the older ones made of wood and mostly held by two hands, and communal. 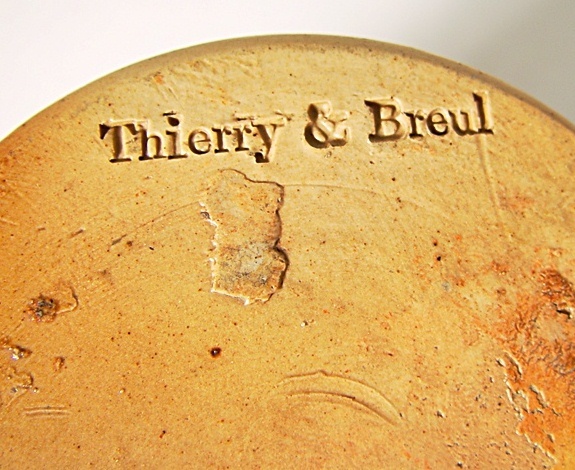 Shown above ▲: A couple of Gambrinus Stein Club members playing cards and sharing a Swedish beer bowl! 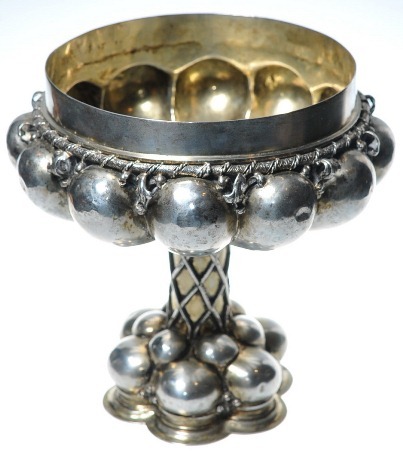 Also see: Wassail Bowl (English ), Mazer (Scottish mostly) ) and Kovsh and Bratina (Russian) ………………………………………………………………………………………………………………………………….. 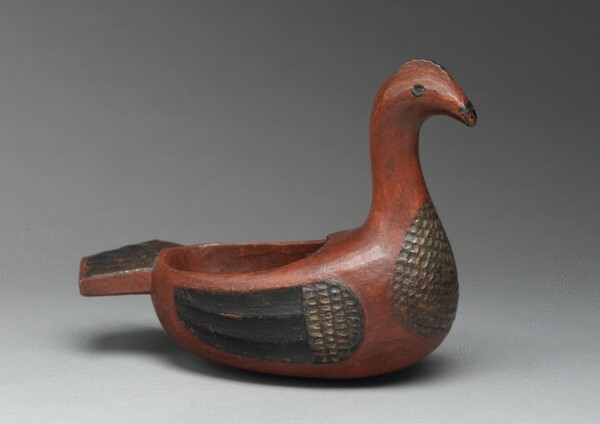 Above ▲:A carved wooden Drinking bowl from Norway, called an “Ale Hen” by a London antiques dealer. I have never seen that term used before but I’ve only been collecting for 43 years!! 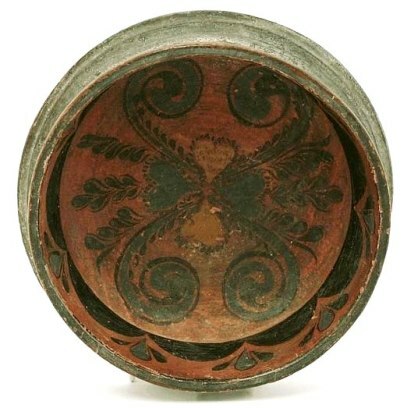 Drinking bowl – Not handled or un-handled (which could imply the handles were broken off, which these weren’t. ) 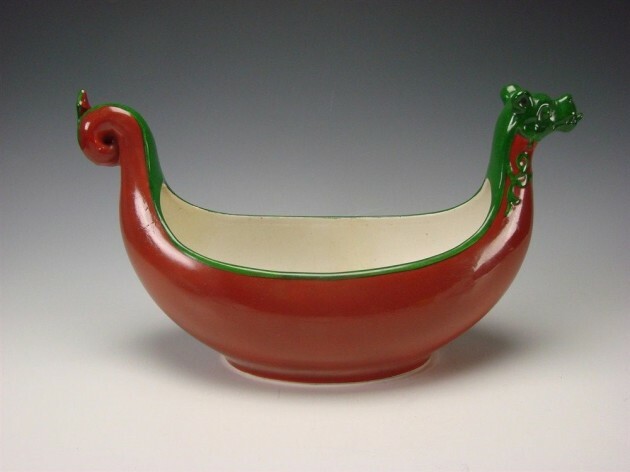 (Also called “beer bowls.” ) Along with those above were also favored vessels in Scandinavia and the Baltic States. 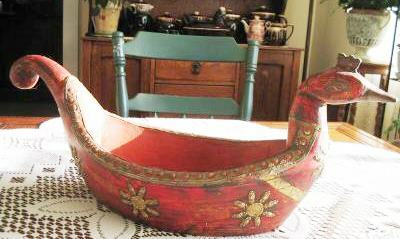 Inside view of another unhandled Scandinavian drinking bowl – seems like a shame to use it. 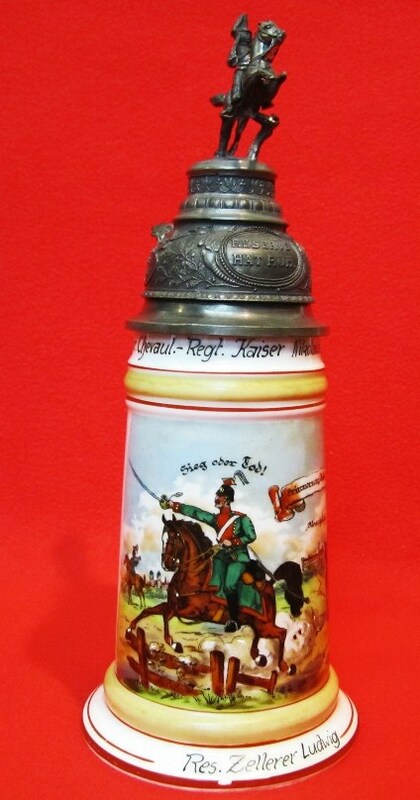 D.B.P.= Deutsches Bundespatent = German Federal Patent- Post 1949. D.R.P. 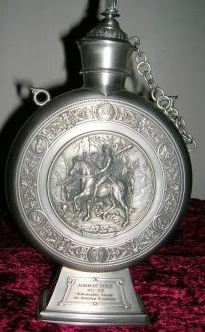 – Deutsches Reichpatent = German Federal Patent – Pre 1949. 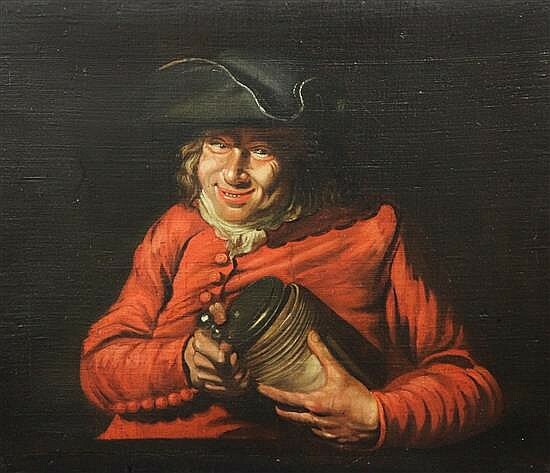 Drum — The section of the vessel between the lid and the base; the main body of a drinking vessel. 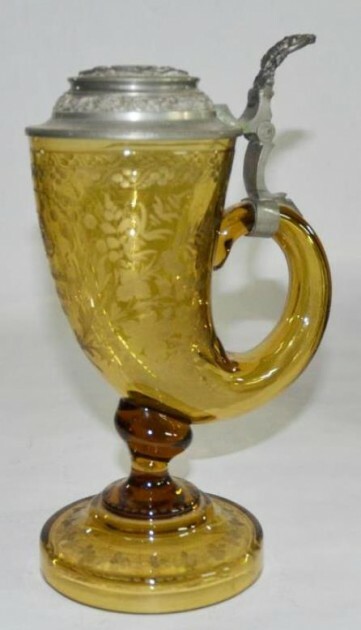 A modern day copy of a clear glass “horn stein,” the design made famous by W.M.F. 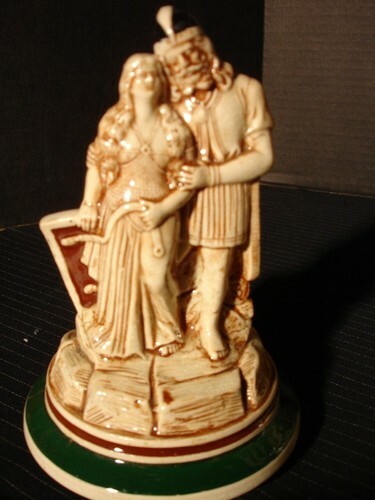 (A COUPLE SHOWN BELOW ♥) back about 1890 0. 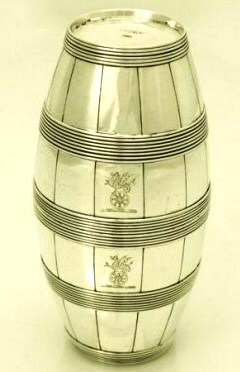 Some of the older horns had a silver-plated brass lid, not pewter as on this one, or the one just below. 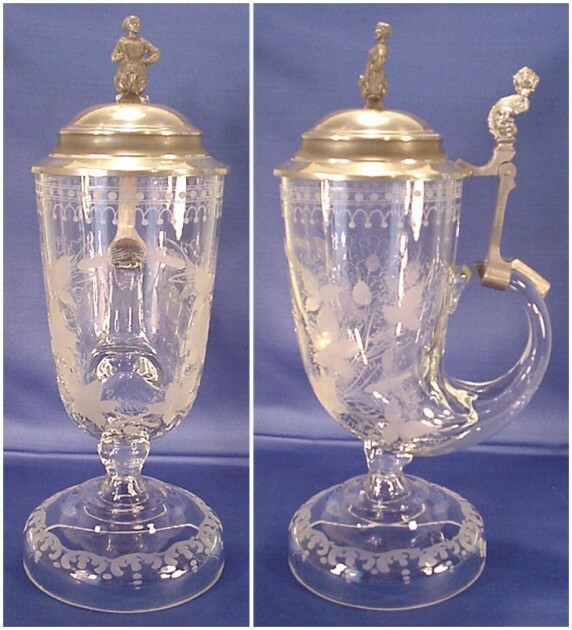 Another great piece by WMF who had their own glasshutte, so this stein and the colorless glass above more than likely would have been engraved [not etched ] by them also. 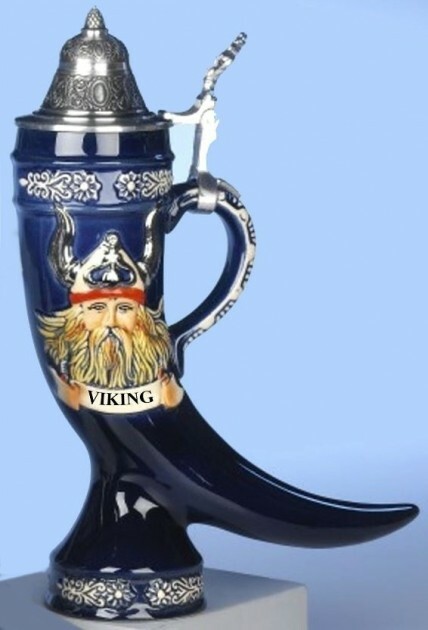 BELOW NEWEER GLASS HORN STEINS IN THE OLD TRADITION. 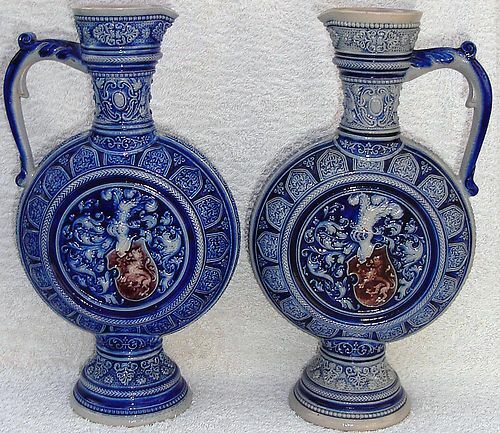 Dudson – James T. Dudson, Manufacturer of Earthenware, White and Colored Stone Bodies and Jasper Ware. Hope Street, Hanley. 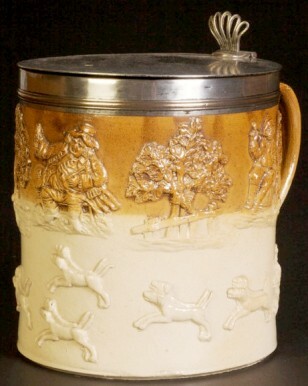 Shown: English jasper ware stein, height 6 1/4 In. 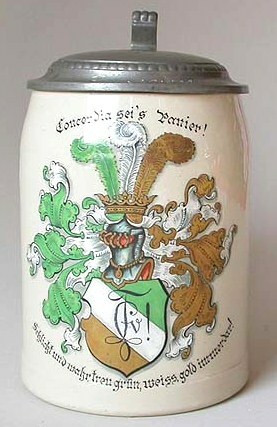 Concordia Corps Coburg Studentenkrug …………………………………………………………………………………………………………………………………..
Dueling Sicieties / Student Societies) steins – There is no sense in me writing all about this subject when there is such a good introductory article on them already: See article:German Student Societies, History and Traditions, A Bibliography by Walter B. Vogdes @ the “Reading Room,” http://www.steincollectors.org/ From Vogdes article referenced above. 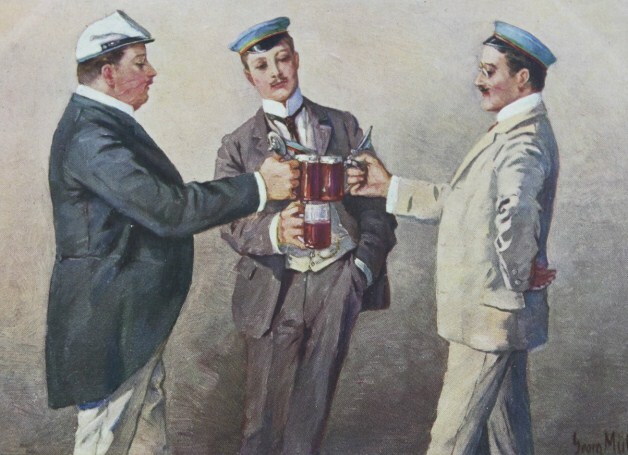 : The origins of the German student societies stretch back to the 12th century, when the first European universities were formed in Bologna and Paris. Young men who spoke the same language and perhaps shared some family ties found protection by banding together. The first “German” university was founded in Prague in 1348, and it included four student organizations, at that time called Nationes. 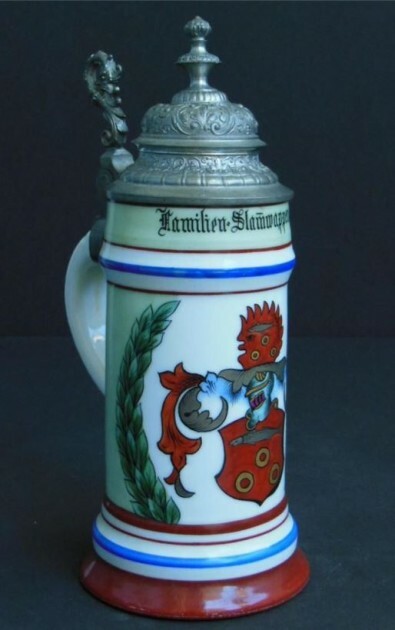 Still reflecting ties to a shared homeland, these groups were named for Bohemia, Bavaria, Saxony and Poland. Since those early days the societies have diversified quite a bit, but they still cling to centuries of tradition and ritual. …………………………………………………………………………………………………………………………………. 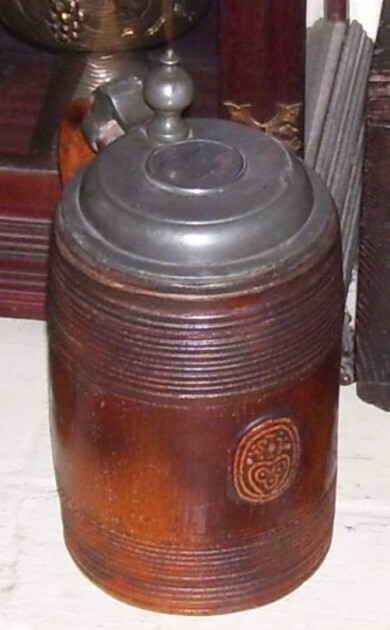 Shown above: 25L, mold blown, hobnail pattern, porcelain inlaid lid. 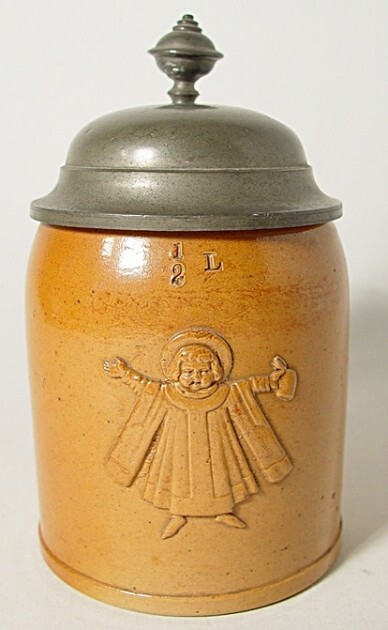 “Rauracia sei’s Panier!” 1893 – 1894. 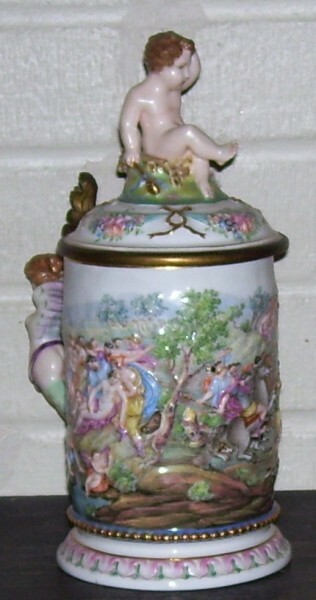 [tsaco] Also see:  http://www.beerstein.net/articles/bsj-3a.htm  http://www.beerstein.net/articles/bsj-5b.htm STEVE’S NOTE: Many uneducated dealer s/ sellers on for sale web sites, now think that any stein that shows a brightly painted Coat of Arms is automatically a “Students stein., and they try to sell them as s=that. A couple Examples are below. 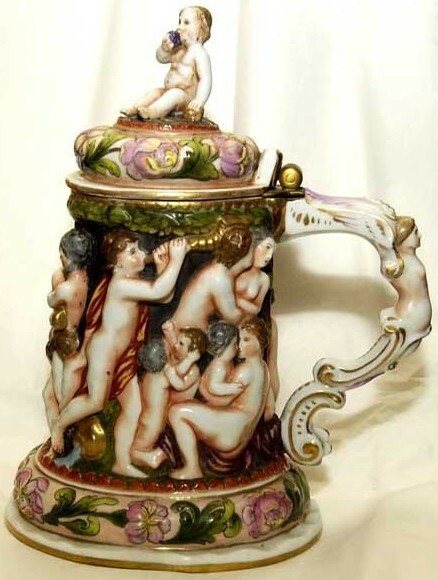 There were other societies that had their arms on steins , notably Singing and Musical groups. 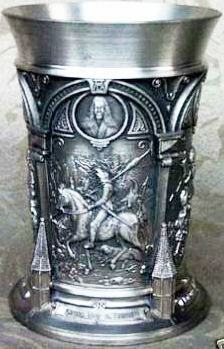 95% of All Student dueling Sovietizes will have arms where  one quarter will show crossed swords on it . 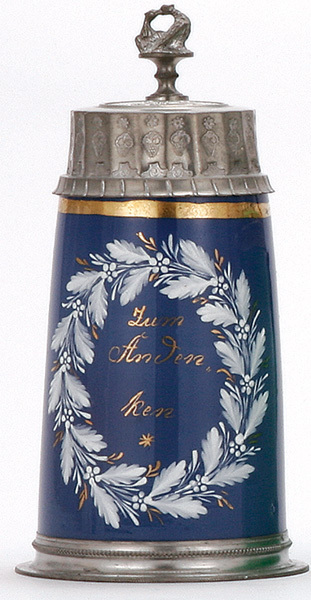 a Zirkel is displayed as on the glass stein just above. 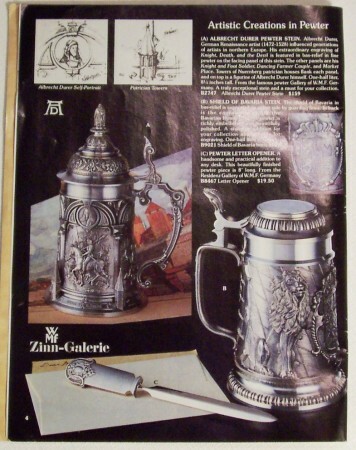 “Durer” artwork – A series of different drinking vessels made in pewter by WMF in the late 1900’s. 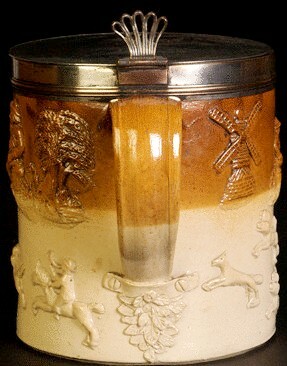 This series produced a stein, server, beaker and flask all with essentially the same Durer drawings, done in molded relief. …………………………………………………………………………………………………………………………………. 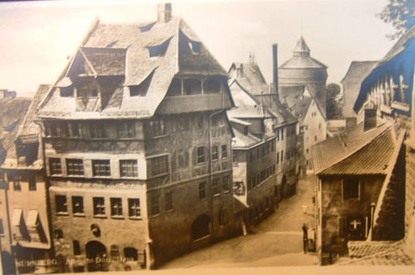 Durerturm – The tower on the Old City wall of Nuremberg that is closest to Durer’s home. ………………………………………………………………………………………………………………………………….